Acupuncture is a medical art developed over 2,000 years ago. The acupuncturist places needles at specific sites on the body called acupuncture points, and may also incorporate hands-on techniques to facilitate the healing process. 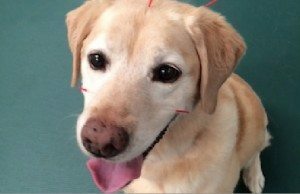 HOW MANY ACUPUNCTURE TREATMENTS WILL MY ANIMAL NEED? How often we need to do acupuncture, and how long we need to continue with treatments, is entirely dependent on the condition itself. Acute conditions, like a muscle strain or upset stomach, may only required 1 to 3 treatments. Chronic conditions often require weekly or biweekly acupuncture treatments for several months. Chronic, more permanent conditions like arthritis require ongoing care. Once Weekly For 4 Weeks: Most clients seek acupuncture for their dogs for chronic conditions, so I ask clients to plan on at least 4 weekly treatments and then we will reassess our progress. It is not uncommon to see little to no change in the first 2 or even 3 treatments. If we are not seeing change in 4 weeks, then we decide together if another modality is more appropriate for your pet. Not every person responds to acupuncture and the same is true for pets. Reduce to Best Interval: My goal is always to “put myself out of business.” As soon as I can, I reduce the frequency of treatment and then try to continue to decrease to the longest span between treatments that keeps the pet comfortable or continues the healing process. Most arthritis patients get to every 3-4 weeks between treatments and most chronic metabolic animals (liver, kidneys) need every 4-6 weeks once they are controlled. Every dog is different and often there is more than one problem to address. End Point: In specific conditions with specific goals, our stopping point is usually clear. For example a dog who has acupuncture after knee surgery usually only needs treatment for the first 2-4 months after surgery. Once he is moving comfortably again, then acupuncture is likely no longer needed. In more chronic conditions, treatment is ongoing at the interval that keeps the pet comfortable and helps the reduce side effects of medications. WILL MY ANIMAL FEEL PAIN? Veterinary patients seem to feel the needles being stimulated when initially placed, but few mind the needles once they are in place. Acupuncture needles are disposable, thin, and designed to penetrate the skin quickly and easily. Most animals appear relaxed and at ease during treatment and after acupuncture. You and your dog get comfortable in the room. Dr. Mandi designed and build large benches for her exam rooms so that you and your dog can sit comfortably together during treatment. Some dogs prefer the floor and that’s OK too! Some pets like our big mat on the floor and still others want the big blanket on the bench. Many times Dr. Mandi will treat small dogs and cats on your lap. We make notes of your pet’s preferences so their comfort zone is repeated on each visit. Dr. Mandi will review your pet’s history. If it is your first visit, we will complete a full physical exam before treatment. If we are following up from previous treatments, we will discuss your pet’s response to treatment and if there are new issues to address. Needles are placed. Acupuncture needles are much smaller than a needle used for injection. Many times dogs don’t even notice their application. If there is a sensitive point, generally there is an initial pinch and then it dissipates. Dr. Mandi removes any needle that is uncomfortable (which doesn’t happen often). You and your pet relax together for about 10 minutes. Your dog will not lay on needles in a dangerous way, they know to stay comfortable. Depending on your pet’s condition the needles may be treated with a warming herb, or we may apply electrical stimulation. Most dogs relax very deeply with acupuncture, getting heavy eyelids, giving us big comfy sighs and even going to sleep. Dr. Mandi removes the needles and discusses further treatment with you. Additional therapeutic modalities can be added also such as laser, physiotherapy and/or underwater treadmill therapy. 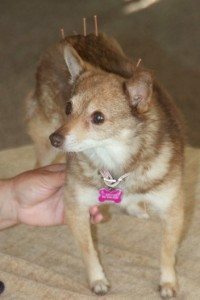 Healing Arts Animal Care in Beaverton, Oregon provides veterinary acupuncture, pet rehabilitation therapy, physical therapy and athletic conditioning to the dogs and cats of the Portland Metro Area including Hillsboro, Lake Oswego, and Tualatin. We strive to create a team among you, your pet, your veterinarian and ourselves to create a whole package of care for your pet. Pets come through our door knowing that we’re going to have fun here and this isn’t “another trip to the vet.” Through manual therapies, acupuncture, laser, ultrasound, underwater treadmill and creating a tailored individual home exercises, we strive to bring your injured pet back to speed, keep your elderly pet as an active member of the family, return your obese pet back to a functional friend and keep your athletic pet at the peak of his performance.